The Hyundai R35Z-9A, shown here, is one of six new Tier 4 Final-compliant models. 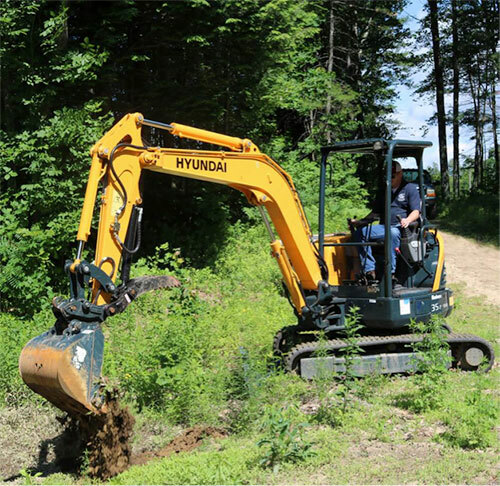 Hyundai Construction Equipment Americas released its 9A series of Tier 4 Final-compliant compact excavators. These machines include the mini R17Z-9A, R25Z-9A, R35Z-9A, R55-9A and R60CR-9A models and the midi R80CR-9A model. Kubota engines power the new Hyundai 9A series models R17Z-9A and R25Z-9A, and Yanmar engines power the R35Z-9A, R55-9A, R60CR-9A and R80CR-9A. Both the Kubota and Yanmar engines provide efficient fuel combustion and reduced noise, Hyndai said. The product line gives contractors a choice of models in each of six popular weight classes: 1.7, 2.5, 3.5, 5.5, 6.0 and 8.2 metric tons. A boom swing function designed for efficient work in congested areas, such as near buildings or single lane roadways.